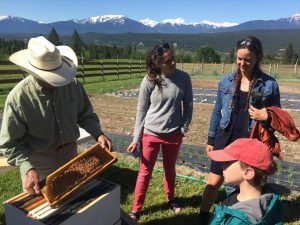 Kids “Bee” Creative with Wildsight Invermere as we join forces with Tegart Honey for a child-centered workshop all about bees. Visit Tegart Farming and discover the world of the honey bees. Beekeeper Rick Tegart will guide you through the wonders of a beehive, learning how honey bee colonies produce honey and have fun watching bees at work. Dianna Tegart will teach you about the production and refining of beeswax and then you will make a beeswax candle to take home. There will also be an opportunity for honey tasting. See, hear, taste, smell and touch!